3-Phase C-Band power line signal coupler designed specifically for the Echelon i.LON SmartServer units with an external power line coupling interface (Echelon part number 72103R-460 (PL)). 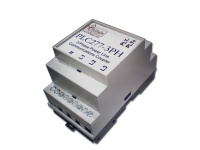 The PLC277-3PHC provides isolated coupling of power line carrier communications to 3-phase and 2-phase power line networks. Ideal for coupling your i.LON SmartServer with streetlights, building power line, or multi-phase residential applications. Rated up to 277V AC mains voltage. Low voltage side designed for direct interface to the i.LON SmartServer PLT+/PLT- port. Operates in the C-Band. PLT+/PLT- port supports connections up to 30VAC, 42VDC. Volume discounts available to qualified distributors. Contact us for volume applications, or buy now.